On a Friday afternoon, a customer enters a beauty spa that looks like the whole place has been dipped in pink. The difference from ordinary spas is that everything here at Shushu & Sassy is miniature-sized, from the gowns to the chairs. Clad in a pink bathrobe and a hair band shaped like rabbit ears, the customer lets go of her mother’s hand and soaks her feet in a bubbly basin. A spa specialist then carefully covers the child’s tiny face with a sheet mask and massages her hands and arms with lotion. The 10-minute beauty ritual ends with a touch of sunscreen and lipstick. Shushu & Sassy is one of many beauty brands that target very young customers. The company started with cosmetic products for kids, but it has now expanded its business to beauty spa facilities, in response to growing demand from consumers. 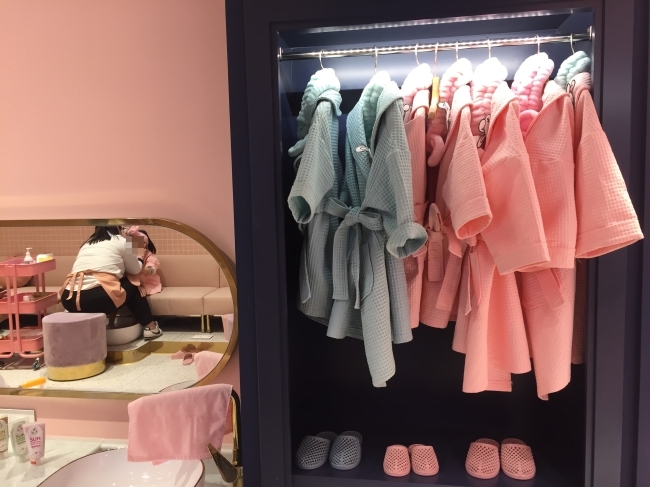 “Customers’ ages vary from 36 months to 13 years, but most are between 4 and 7,” the store’s vice manager Han Ah-reum said. Just like beauty spas for adults, kids’ spas offer a full range of treatments for their young customers, including foot spas, massages, skin care, manicures, pedicures, hair styling and makeup. Shushu & Sassy said all products used in its treatments are made with toxic-free ingredients, such as herbs or natural pigments. Prices for the treatments range between 25,000 won ($22) to 40,000 won, depending on the time taken and treatment routines. “This place is often introduced on YouTube channels, and my daughter kept asking me to bring her here someday,” said the 5-year-old customer’s mother, Kim Mi-hyun. Han advises making reservations for weekends at least a week in advance, as the place gets booked up quickly. As the spa has become popular among kids and their parents, its number of branches has increased to 10 in two years. Besides beauty spas run by cosmetic brands, kids cafes and hotels have also rushed to enter the beauty business for kids. Popular Korean kids cafe franchise Carrie Kids Cafe, for instance, features the Beauty and Spa Salon, which provides skin care and makeup services. Makeup rooms can easily be spotted at other kids cafes as well, where young customers can try makeup products prepared at dressing tables. Meanwhile, Grand Hyatt Seoul has been offering annual family friendly packages that feature beauty programs for kids. In collaboration with beauty brands, the hotel provides young customers with the opportunity to experience makeup and spa treatments. Unlike the past, when kids played with plastic cosmetic sets, toys these days have evolved to include real makeup tools that children can use. “Become pretty like Secret Jouju!” the TV advertisement for the Secret Jouju Makeup Bag says, encouraging kids to put on makeup. The 56,000 won toy kit includes a vitamin sunscreen cushion, color lip balm, cream blusher, eyeshadow and nail polish. A search for “children cosmetics” on online shopping site 11 Street found more than 8,000 products, ranging from skin care products, such as face masks, to makeup products. 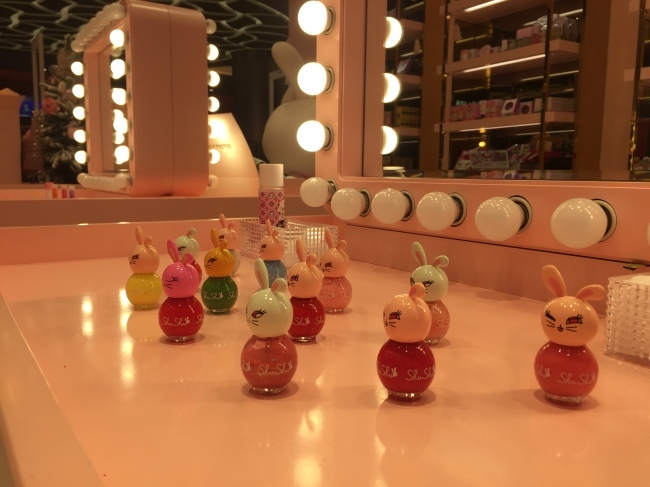 “Sales of cosmetics for young kids have increased drastically since April 2018, when companies rolled out new products for the upcoming Children’s Day,” 11 Street manager Lee Kyo-taek told The Korea Herald. According to Lee, sales of such products in 2018 increased about 340 percent compared to 2017, amid the soaring popularity of kids’ beauty products. Some experts are concerned about the makeup fad among young kids. 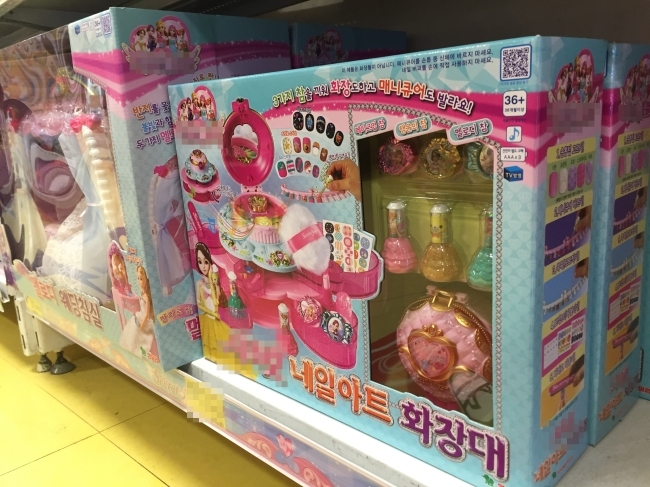 “Many people call the fad ‘kids’ beauty,’ but the cosmetic products and YouTube content mainly target little girls (rather than boys,)” said Yunkim Ji-yeong, an assistant professor of the Institute of Body and Culture at Konkuk University. As a major media platform for children, including toddlers, YouTube features many videos on kids’ makeup tutorials and reviews of cosmetic toys. A video by YouTuber Hey Jini illustrates how 4-year-old YouTubers Sua and Suji transform into pretty Secret Jouju characters by applying makeup. It garnered 3.4 million views. “By watching their favorite YouTubers use makeup products to enhance their appearance, or constantly being exposed to such culture, children can become greatly convinced that makeup is a must, particularly for women,” said assistant professor Yunkim.